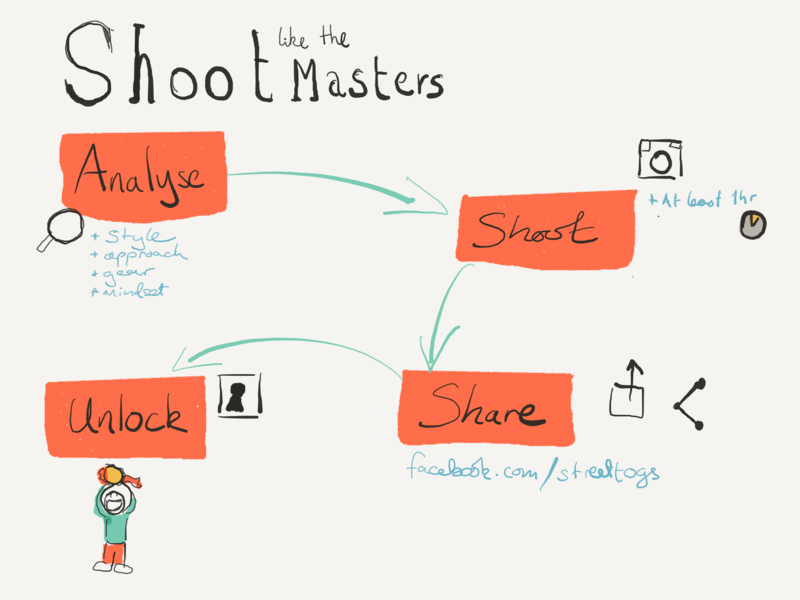 Welcome to the first in a series of blog posts on how to shoot Street photography like the masters. Each time we’ll look at a different masters work, break down how they took pictures, approached the street and got their unique look and then it’s over to you (and me) to try to emulate this master and take a series of photos as if you were them. Obviously there are limits to how close we can recreate their images depending on a variety of factors from our talent, where we live and gear but even factors like the time we live in may well have an impact too. As such, we won’t get it exactly the same, but the point is to try and work out what we can make our own from that photographer’s style. To start with, I choose arguable the master of street photography. How to shoot street photography like Henri Cartier-Bresson. Who was Henri Cartier-Bresson ? Henri Cartier-Bresson was a French photographer who came from a middle class French background. He studied painting and art at a private art school and became deeply connected with different artistic communities that influenced his later work. His photography really advanced when he acquired a Leica rangfinder camera that he later became synonymous with. This camera provided him with the opportunity to capture candid moments that he became identified with and lead to his concept of “the decisive moment”. Cartier-Bresson went on to form one of the most prestigious photo agencies, Magnum along with Robert Capa and David Seymon (Szymin). At Magnum, he document many milestones in the 20th Century including Ghandi’s funeral, the end of the Chinese civil war and the start of the Maoist government in China. He later retired from Photography and changed to drawing and painting. Henri is famous for having shot with a Leica rangefinder camera and a 50mm lens reportedly his whole career. It looks like he switched from the earlier Leica III series of cameras to the Leica M3 and M4 later on and he also reportedly used auxiliary viewfinders which had a wider frame for his composition. Another key aspect of Henri’s style was that he only shot black and white. This may well be a large factor in why people associate street photography with black and white now. These films were no where near the speeds we see today with the film that he started using probably around ISO 60 or so. This makes those decisive moments even more impressive. Obviously, the closest gear you could get to Henri would be an old Leica m4 with a 50mm and slower black and white film. However, that could cost you a couple of grand if you don’t have one to hand. A modern digital rangefinder, such as the fujifilm x-pro or Fujifilm x100 series and a 50mm equivalent would get you close as well and cost a lot less, but in truth, a 50mm focal length will get you close to his perspective. To get a setup like Henri’s, I’m going to cheat a bit. I’m using my Fuji x100t with the TCL-X100 tele lens adapter. This is an APS-C sensor with a 35mm lens that provides a 50mm equivalent. That doesn’t mean it will look exactly the same (depth of field and so on) but it’s the closest I can get without spending a load of money on a Leica camera. I’m going to set the camera to the lowest ISO setting (ISO 200 in raw, ISO “100” in jpeg) which is still faster than Henri’s early days but possible for later in his career. And I will shoot using the optical viewfinder but using the black and white fujifilm simulation. While this won’t completely accurately replicate the type of film that was around in those times, it will be a good starting point, from which I can then use some filters. Some of Henri’s settings were clearly influenced by the gear that he used at the time. For example, the slower film than we are used to today meant that his shutter speed didn’t always “freeze” the action. Just look at his image of the man jumping in the puddle or the cyclist. At the same time, he generally seemed to use a deeper depth of field so he could capture all the action. I don’t want to be too ridged in my settings but instead try to use Henri’s mindset with his settings. As such, setting my ISO at a fixed 100 and trying to use a deeper depth of field will help this a lot. In general I’ll aim to keep my shutter speed at around 1/125 or 1/60 if I need though faster if it is a bright day. However, the “look” and gear is only one part of shooting like Henri, the second part is trying to mimic his “eye” and see the street in the way that he did. Seeing as he coined the term “the decisive moment” it is no surprise that this idea should be associated with him. It’s the concept of taking a picture at the exact moment when things occur or a composition forms. This could be when a subject is in exactly the right place (such as his famous photo of the man jumping across a puddle when he captured it as he is just about to land. Or it could be the moment when a boring scene suddenly changes due to one of the people in it doing something right. This is even more impressive when you consider he didn’t have a burst mode on his camera! In my challenge, I’m going to look for these decisive moments, the ones where suddenly the scene is right and everything lines up. AND I won’t use burst mode on my camera to get them either. Henri also made ample use of geometric shapes in his images, using them as frames within frames or guidelines for the viewer’s eyes. This was probably influenced by his background in painting and exposure to the classic artist who used similar features in their images. When looking for backgrounds on the street, identifying and utilizing these geometric shapes will really help us to get a Henri style look. This shouldn’t be too difficult, as in reality, the world is made up of these shapes, we just need to notice them. In contrast to many modern street photographers who use many built up layers to create rich and vibrant scenes, many of Henri’s photos have a single or a couple of subjects in them. He tends towards a more minimalist approach where all the objects build towards the central goal and subject of the photo. In my photos, I will seek to create minimalist photos, with few subjects and utilizing the settings to drive attention to those subjects. Although Henri was a firm believer in candid photography with no involvement with those he photographed, he believed in making an emotional connection with these subjects and sought to show them as they were. Like many street photographers, it is hard to see any judgement from Henri’s images. Instead he seeks to show their world and connections with the subject. I believe this will be a difficult aspect to attempt. After all, showing an emotional connection to the subjects of a photograph isn’t something that you can just do out of hand and empathy isn’t something that can just be learnt over night. Still I will attempt it in this challenge. In general, a lot of Henri’s photos don’t play with creative lighting, using pockets of light or reflections from different spots, but instead they are generally more universal in the scenes. That doesn’t mean the light isn’t “harsh” with shadows present, but he seemed to prefer keeping the whole background in view and not “crushing the blacks”. This meant he had to look for good scenes and not just creative light. If you want to join in with the challenge then here are your next steps. Wait for your achievement badge. I’d love it if you shared this post with anyone else who might be interested in the challenge and if you’d like to blog about the challenge, leave a link in the comments below. It’s only a myth . . .
One of Cartier-Bresson’s most significant color projects was a 1958 assignment for LIFE, as you still can find on the website of Time Life. But it’s a nice myth . . .
and I like his photo’s in colour and black and white. In interviews he did say he used colour film, but only did it for the money. He also distroid many of his colour negatives, but some of them were published like the ones in Life. Maybe he did all that only for the myth . . . I believe your statement justifies my comments. Yes he did shoot colour but he didn’t enjoy shooting colour and very few of his colour works remain. As such, if you want to “shoot like bresson” then you should shoot black and white to create an image that is “typical of him” obviously you can aim to recreate his colour work, or you can shoot in your own style and focus on colour/black and white a mixture of the two or whatever, but that’s not the point of this post. Don’t be too discouraged about the chance to shoot with equipment close to that which Cartier-Bresson used without looking around for a Leica IIIa or IIIc – I’ve bought one of each in the past few years for a few hundred USD, and another hundred in cleaning, lubing and adjusting. Decent older 5cm Leica lenses can be had in a similar price range – quite a bit cheaper than shelling out for any Fuji X100 newer than an S, and certainly cheaper than the Fuji tele adapter. Not that I don’t also love my X100S (although I use a 35 USD Panasonic tele adapter instead of the posh Fuji).